5th Annual Q2Q Comics Costume Contest Winners! Thanks to everyone that submitted. The costumes, as always, were spectacular. Let’s do this again next year! 4th Annual Costume Contest Winners! We had more submissions this year than in all previous years combined! I’ve sifted through the heaps of entries to bring you the best of the best. First prize this year is taking home a stuffed cryptid and a doodled copy of Q2Q Comics Vol. 1, while the runners up are getting signed prints of the comic of their choice. Thanks to everyone that submitted! It was a very competitive field this year. There were so many good costumes. Don’t Forget to Submit Your Entries for the Costume Contest! It’s Halloween and the deadline to submit entries into the 2nd Annual Q2Q Comics Costume contest is fast approaching! 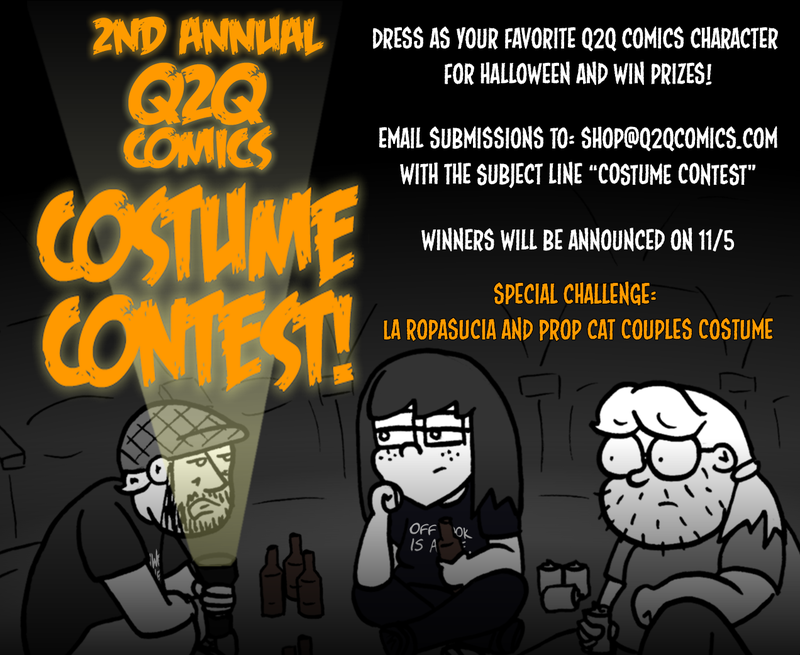 If you’re dressing like a character from Q2Q Comics, make sure you get pictures and enter them in the costume contest! Prizes will be award to First place and a few runner-ups. A special prize will be awarded to the best La Ropasucia and Prop Cat couples costume! Submit your entries to shop@q2qcomics.com with the subject line “Costume Contest.” Entries must be submitted by 11:59 PM EST on 11/4/15. Winners will be announced on 11/5/15.